OBJECTIVES: This study aimed at evaluating the effect of using a 45S5 bioglass paste and a topical fluoride as protective agents against acidic erosion (resembling acidic beverage softdrinks intake) for enamel surrounding orthodontic brackets. MATERIALS AND METHODS: Sample of 21 freshly extracted sound incisor and premolar teeth was randomly divided into three equal groups: a bioglass group (Bioglass) (NovaMin, 5-mm average particle, NovaMin Technology), a Fluoride group (Fluoride) (Gelato APF Gel, Keystone Industries), and a control group (Control). Orthodontic brackets were bonded to the utilized teeth usingMIP (Moisture Insensitive Primer) and Transbond PLUS color change adhesive. All specimens were challenged by 1% citric acid for 18 min. The top enamel surfaces next to the orthodontic brackets were examined by SEM-EDS. Wilcoxon Signed-Rank test was used to compare the area covered by the 45S5 bioglass paste before/after erosion P < 0.05. RESULTS: 45S5 bioglass paste application resulted in the formation of an interaction layer that significantly resisted erosion challenge P < 0.05. The fluoride and control specimens showed signs of erosion of the enamel next to the orthodontic brackets (P < 0.05). CONCLUSION: 45S5 bioglass paste can efficiently protect the enamel surfaces next to orthodontic brackets for acidic erosion challenges. OBJECTIVES: To determine whether the modification of dental occlusion, without molar extraction, affected the gustatory papillae located in the tongue of growing rats. MATERIALS AND METHODS: Five-week-old male Wistar rats were randomly divided into an anterior bite plate (ABP) group and a control group. 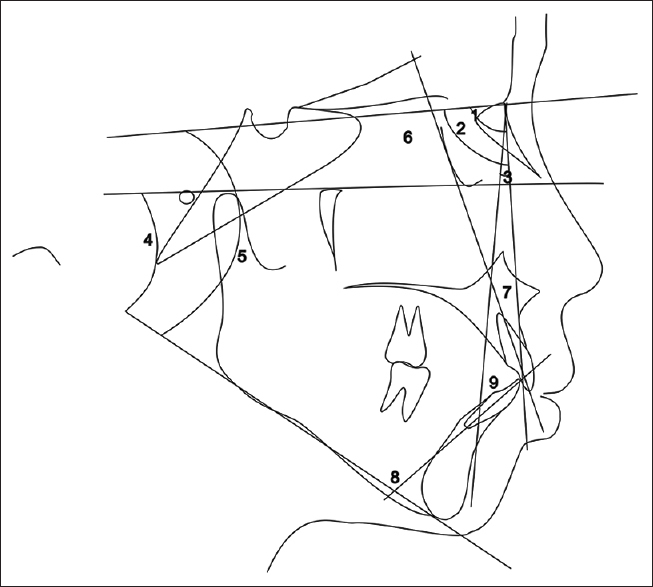 Under general anesthesia, ABPs were placed on the occlusal surfaces of the maxillary incisors, while metal caps covered the mandibular incisal edges of the rats in the ABP group. The control group rats underwent a sham operation. The rats in both groups were euthanized 14 days after the procedure. The circumvallate papillae and taste buds were analyzed by immunohistochemical methods, and the fungiform papillae were observed and counted after immersion of the tongue in 1% methylene blue. 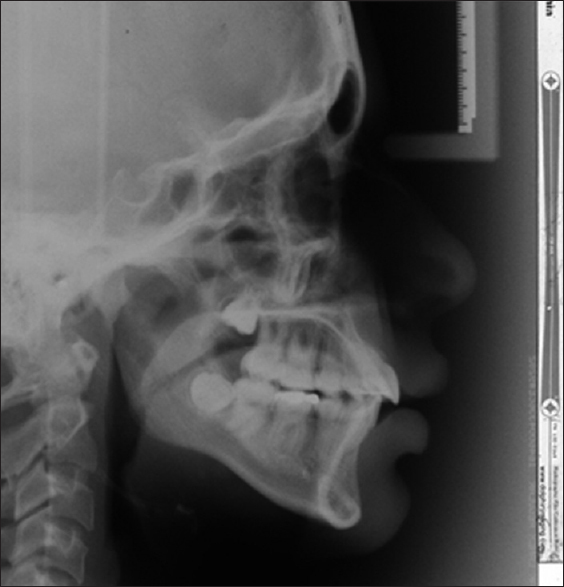 RESULTS: Two weeks after ABP insertion and mandibular incisal cap placement, the gustatory papillae exhibited morphological and structural changes. 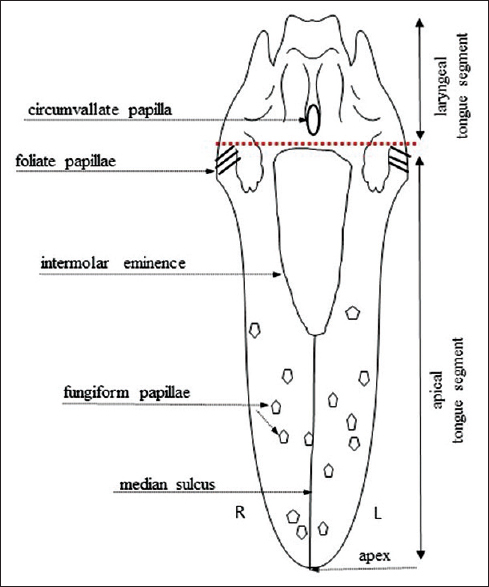 The rats in the ABP group had exhibited significantly fewer fungiform papillae, and narrower circumvallate papillae, with greater trench depths, larger trench profile areas, smaller taste bud profile areas, lower ratios of the taste bud profile area to the trench profile area, and more taste buds than those in the control group. CONCLUSIONS: Our findings support the association between occlusal and taste functions and provide a basis for further studies on the gustatory function. In conclusion, loss of molar occlusion, resulting from the ABP and metal cap insertion, altered the peripheral gustatory receptors in the growing rats. OBJECTIVE: To evaluate the maxillary canine retraction rate and anchorage loss with active and passive self-ligating brackets (SLBs). MATERIALS AND METHODS: The study was conducted on 10 patients whose age ranged from 14–20 years. The patients had minimal to no crowding with a dental protrusion of maxillary incisor that required the extraction of maxillary first premolars and retraction of canines. 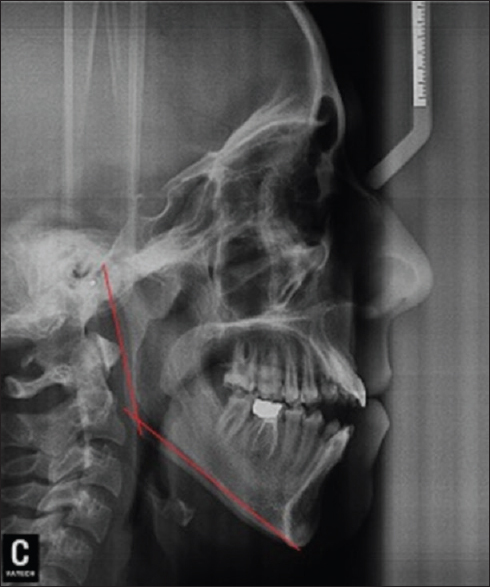 The maxillary canines had to be in a good alignment and level before treatment to ensure that canine retraction had started from the same point bilaterally. 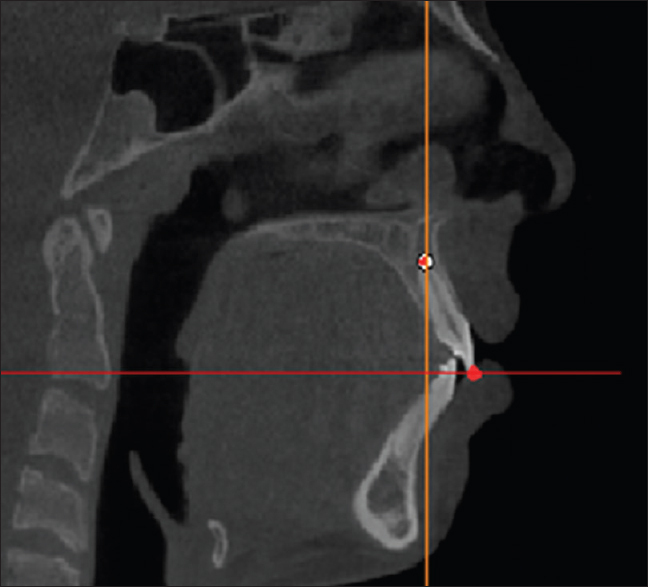 A cone beam computed tomography (CBCT) had been taken for each patient's maxilla before treatment initiation and after complete canine retraction. Using nickel titanium, close-coil spring canine retraction on both sides and the rate of canine movement was measured. RESULTS: The patients were checked every 2 weeks to measure the retraction rate and ensure that a constant force (150 g) was being delivered to both canines. The pre- and post-canine retractions CBCT were superimposed to evaluate the pattern and rate of canine movement and anchorage loss. The result of this study showed no statistically significant difference between the two groups. CONCLUSION: The type of SLB, either active or passive, does not affect the rate or type of canine movement during its retraction in the orthodontic extraction cases, and the anchorage loss of the upper molars was nearly the same in both type. OBJECTIVE: To evaluate the status of occlusion among school children in city of Abha, Saudi Arabia. MATERIALS AND METHODS: The current study was based on the clinical examination of 1998 Saudis (mean age 14.13 ± 0.99 years) who were randomly selected by a multi-stage random sampling technique from the city of Abha. 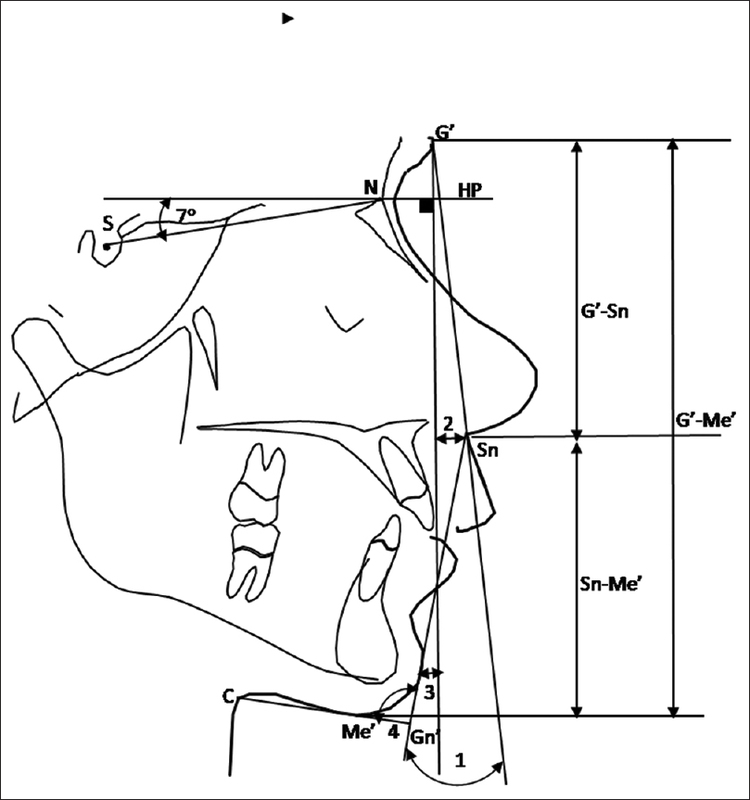 The occlusal parameters recorded in this study were molar and canine relationships, overbite, overjet, crowding, spacing, anterior open bite, anterior crossbite, posterior crossbite, and scissors bite using gloves, light source, mouth mirror, and ruler. 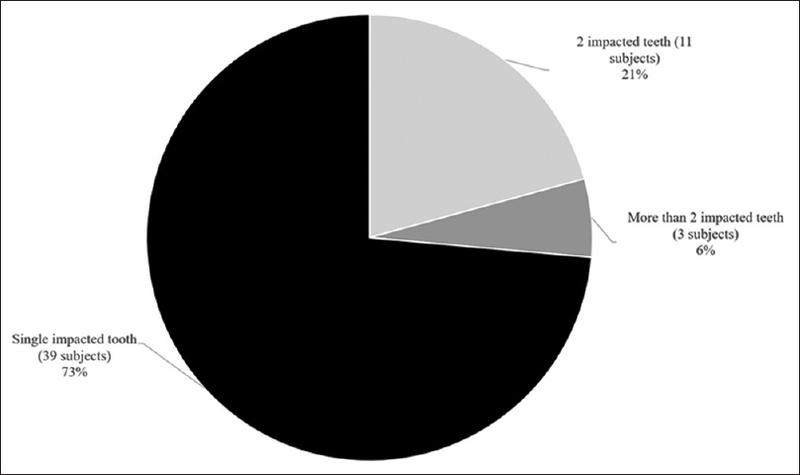 RESULTS: Class I molar relationship was observed in 1219 (61%) of the total sample, while Class II and III molar relationships were observed in 326 (16.3%) and 154 (7.7%), respectively. Class I–III canine relationships were seen in 1255 (62.8%), 231 (11.6%), and 112 (5.6%) of the sample, respectively. Normal overbite was found in 1490 (74.6%) of cases, while 1515 (75.8%) had normal overjet. 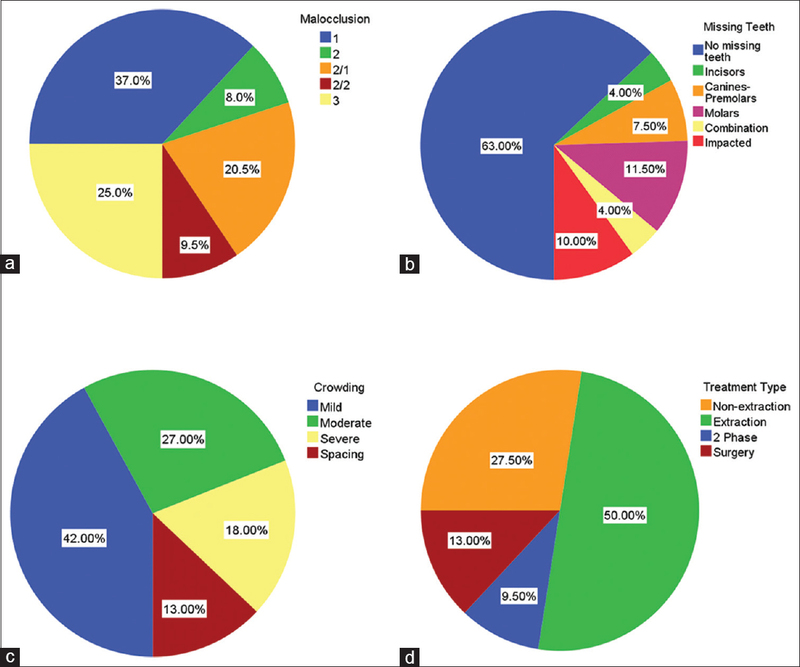 The most prevalent malocclusion trait was crowding (26.6%), followed by spacing (20.6%), increased overjet (19.5%), increased overbite (19.4%), posterior crossbite (8.5%), and anterior open bite (6.1%). CONCLUSIONS: Crowding was the highest occlusal trait in frequency followed by spacing, increased overjet, and increased overbite. 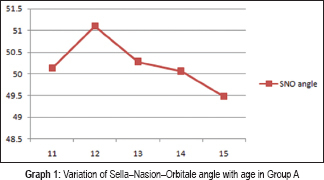 Class I molar and canine relationships, normal overjet, and normal overbite were frequent findings among Saudi adolescents in Abha city. 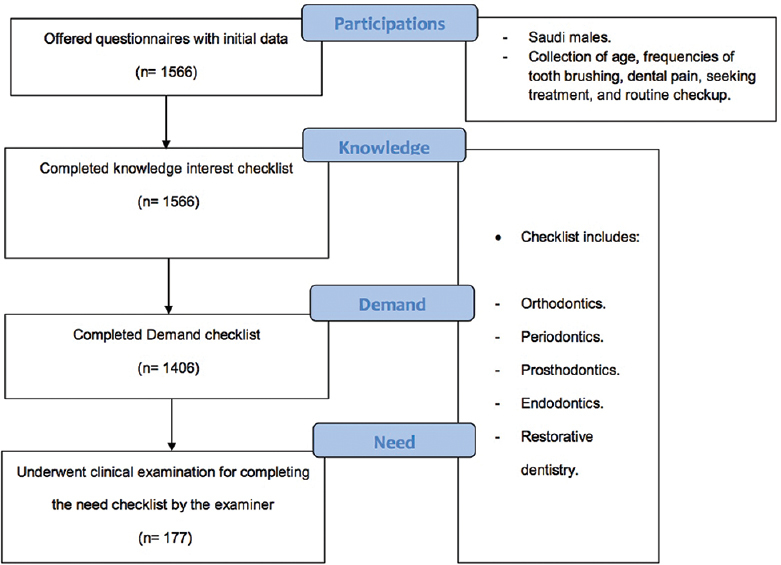 AIMS: To determine the association and level of agreement between young adults' perception of orthodontic treatment need (subjective need) and the orthodontists' assessment of treatment need (normative objective need). METHODOLOGY: For this study, 670 students [280 males and 390 females; mean age (standard deviation) of 15.32 (1.81) years] were selected from public and private schools from different demographic areas of Jeddah city, Saudi Arabia, and divided into two age groups (12–15 years) and (16–19 years). All the participants were examined, and the Index of Orthodontic Treatment Need (IOTN) components [dental health component (DHC) and aesthetic component (AC)] were recorded. 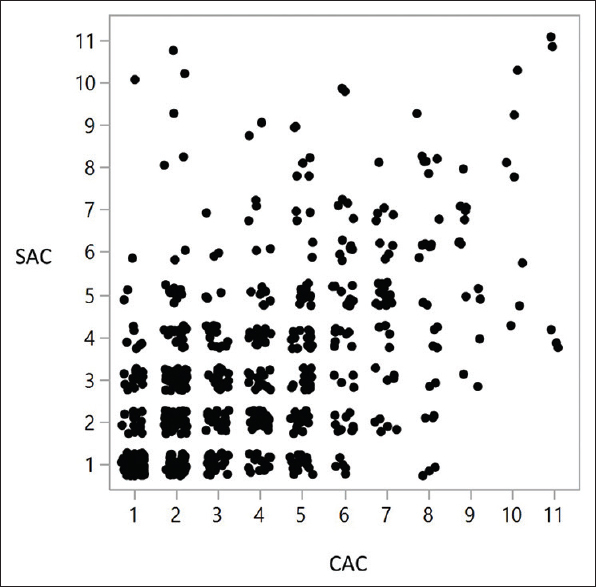 RESULTS: Kappa statistics showed a statistically significant but fair agreement between clinician AC (CAC) and student AC (SAC) assessments in both age groups (k = 0.343 and 0.334, respectively; P < 0.001), whereas Spearman's correlation coefficient showed a statistically significant but moderate association (r = 0.487 and 0.517, respectively; P < 0.001). The degrees of agreement were 76.4% and 76.7% at the no-need and mild-need levels of treatment, respectively. There was a statistically significant but weak association between the subjective and normative needs (SAC and IOTN-DHC) in both age groups (r = 0.336 and 0.360, respectively; P < 0.001). However, the degrees of agreement were 58.9% and 61.5% at the no-need and mild-need levels of treatment, respectively. 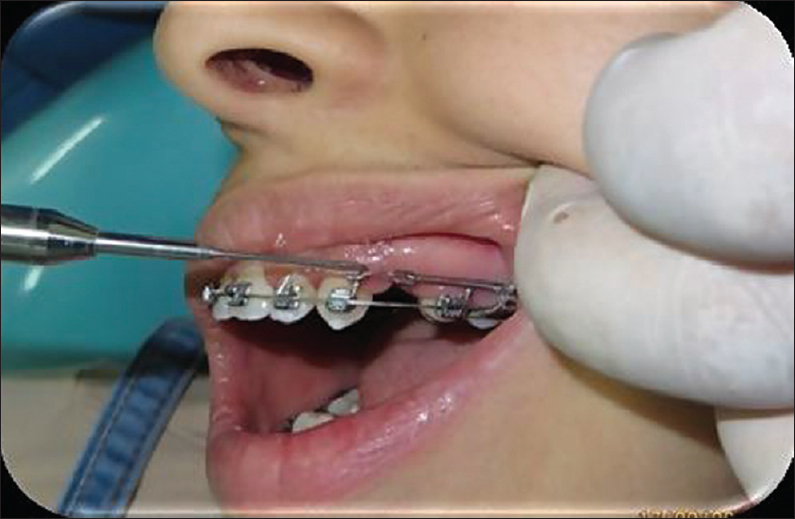 CONCLUSION: Significant but weak positive association was found between the normative and subjective orthodontic treatment needs, indicating a lack of understanding of the nature of malocclusion and its consequences. 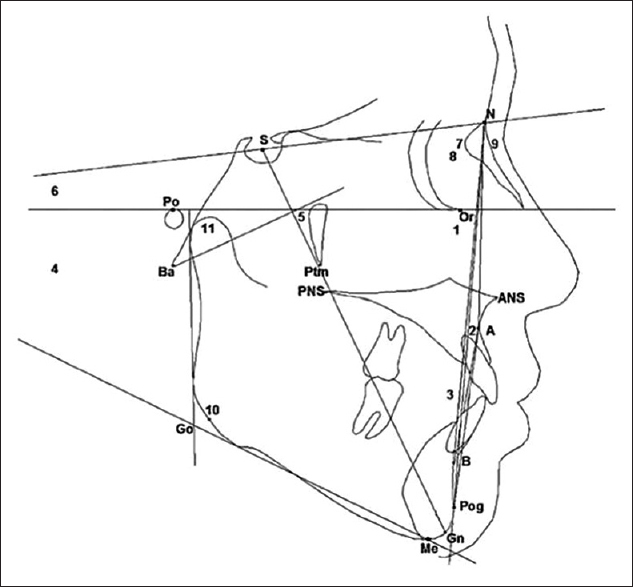 Thus, promoting further knowledge and awareness of malocclusion are indicated.